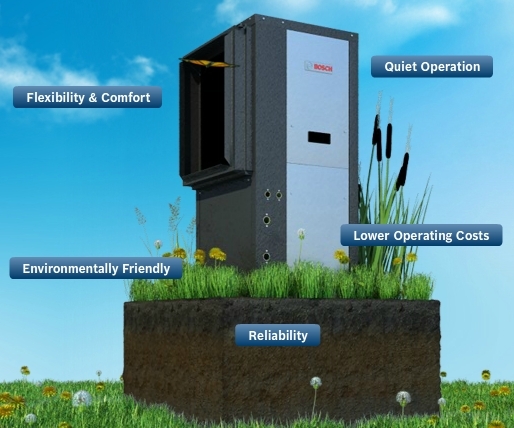 Lowering your monthly utility bills has never been easier with Bosch’s Energy Star rated geothermal heat pumps. Geothermal Heat pumps use the relatively constant temperature of the earth to provide heating, air conditioning and hot water. Geo Thermal Tax Credit: Tax Credit 30% of cost with no upper limit! 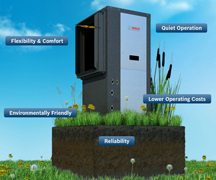 In North America, Bosch Thermotechnology is a leading source of high quality water heating and comfort heating systems. In particular, the company offers BOSCH tankless, point-of-use and heat pump electric water heaters, Bosch solar thermal systems, Buderus floor-standing and wall-hung boilers, FHP geothermal systems as well as controls and accessories for every product line. Bosch Thermotechnology is committed to reinventing energy efficiency by offering smart products that fit together and work together as integrated systems which enhance the quality of your life in an ultra efficient and environmentally friendly manner.